Did you ever enjoy the tranquillity of a tropical fish tank? Well, here's the game for you or is it? This game is about murderous Black Mollies and deadly devices and there all but peace and quiescence in this fish tank. The game comes in the clear and sturdy plastic box already known from Richard de Rijk's "Atta Ants", published last year. And similar to Atta Ants the game uses cards to generate a random board layout. 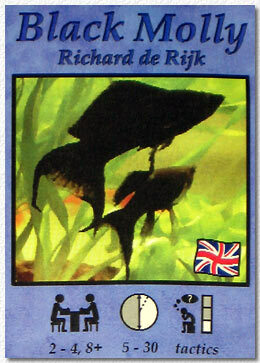 This time 6 by 4 cards depict 24 areas of a tropical fish tank. Some cards (7) show devices like a heater, a catcher, or a pump while other cards (2) depict anemones. Four cards are the start areas for the four fishes of each player while two other cards indicate where the Black Mollies start. The rules are very simple and quickly explained. 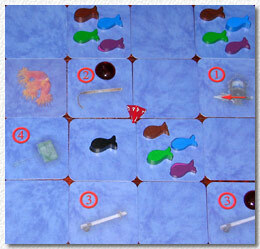 Beginning with the start player all may players move their fishes horizontally or vertically by one area card. Fishes may not end their move on anemone cards or on a device card with an active device. Next, the device statuses are toggled by rolling a four-sided die. The number rolled changes the status of the respective device. Now it is checked if the pump is active. If so, the current moves all fishes in its path one additional area card in the direction of the current. Then it's the Black Mollies turn. They love to feed on young fish and the start player must move them one area card towards the card with the least number of fish. Finally, the devastation results of the devices and the hungry Black Mollies are determined: all fishes on cards with active devices or Black Mollies are taken out of the game. If there are only fishes of one player left, that player wins the game, otherwise the start player changes and the next round begins. If you know Atta Ants and always liked to have an increased level of suspense by adding more spiders, Black Molly can satisfy your needs. With more than half of the area cards being more or less off limits for your fish there's hardly a turn where not some or even all of your fish are at risk. Many times you cannot avoid to move fishes onto a (turned off) device card in order to escape from the approaching Black Mollies, only to find exactly this device being turned on by an unlucky die roll later in the round. Similar to Atta Ants it is important to take into account the player sequence and the position of the start player who is in control of the Black Molly if they have a choice of the route the travel. The rules state that the game lasts between 5 and 30 minutes, which is confirmed by the games we played. Expect rather short playing times with only two players and longer ones with four. The downtime of players already out of the game is not too high as often the game ends with a sudden death of a larger group of fish. Sooner or later some group of fish will be trapped between the Black Mollies and the devices and eventually perish. Players may find it necessary to distract the Black Mollies with a single fish but this is a rather risky venture. Many times, it is successful but also means the certain death of the lonely distracter fish. Black Molly is a non-complex short game with not a lot of tactics to apply and with just about the right amount of luck by die rolling. I can recommend it as a game for families and not so die-hard gamers, if the subject of fishes being eaten, fried by a heater or hacked to death by a pump is not felt to be too inappropriate.